In the last few dev blogs, we sometimes mentioned that we upgraded our buildings and promised that we will talk about it in detail later. Wait no more, the day has come. 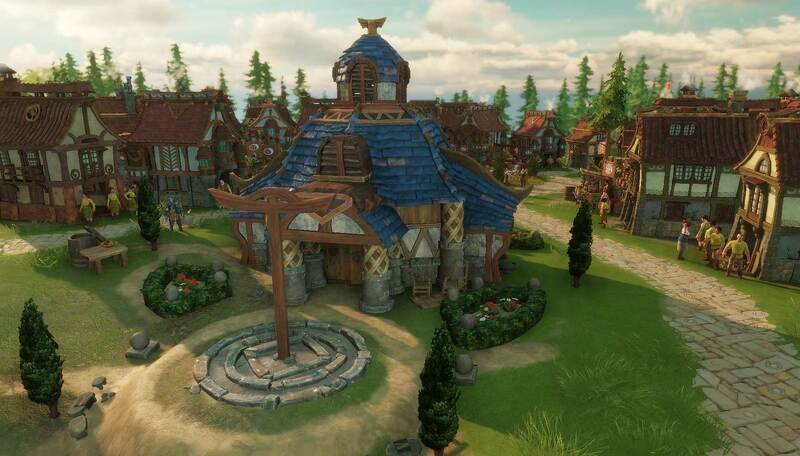 In this blog we cover how we unlock new buildings and why we should upgrade them. After we landed on an undiscovered island, we only have access to very few basic buildings. In order to change this, we need to build the very important Townhall. It is the first building that needs softwood boards produced by a sawmill. Once we have the necessary materials we can build it. By constructing the Townhall we unlocked new buildings and the possibility to upgrade others. In addition to the very first buildings we can now build Coal & Ore Mines, Smelters, Animal & Crop Farms, Weaponsmiths, Caserns and Mints. Please keep in mind that the building list might change in the future. In order to get access to every building in the game, we will need to upgrade the Townhall multiple times. Each upgrades unlocks new buildings and giving us the opportunity to upgrade our existing ones even further. The buildings in The Settlers are divided into several Tiers. Those upgrades unlock new Tiers. 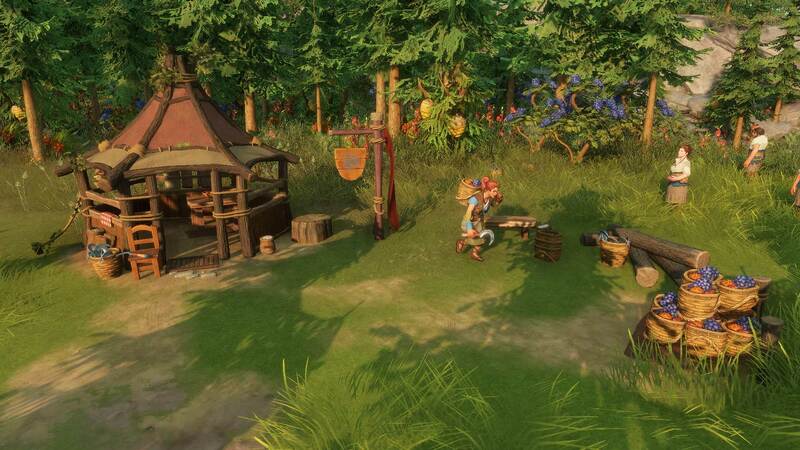 Tier 1 is called the Outpost level, Tier 2 Village level, Tier 3 Town level and Tier 4 is the City level. Going back to the unlocked Tier 2 or Village level buildings: The Ore and Coal Mines provide us with the necessary resources to smelt iron for better military equipment. Additionally, we also unlocked new food production buildings. In order to use the new food we need to upgrade our houses, as explained in the Food and Stamina dev blog, to have access to new recipes. 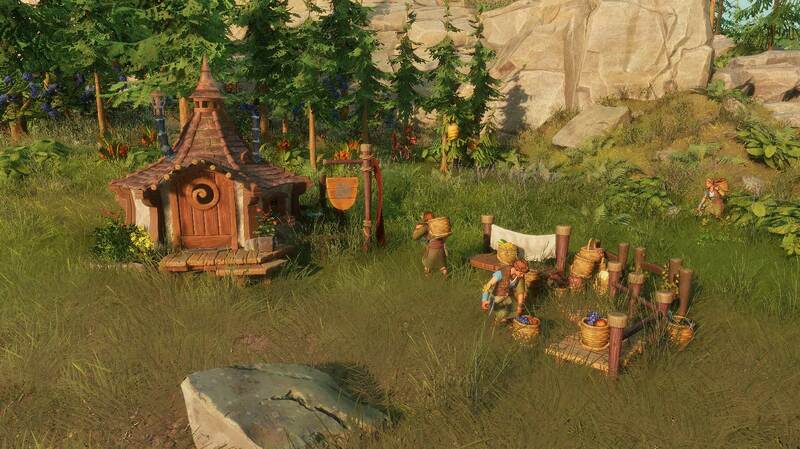 We can also upgrade all previously placed buildings, not only making them more efficient, but also granting them the ability to harvest / gatherer / produce new goods. Let us take a look at the Gatherer, how the building evolves and what changes throughout the upgrades. The Tier 1 Gatherer is available right from the start, has one worker and can only collect berries. This is sufficient when we start a new settlement, but with the growing needs of our workers we need herbs or mushrooms soon. Our basic gatherer cannot collect those resources. It is time to upgrade. For this we need softwood boards. Once the construction is done our Gatherer can collect herbs and he or she gets company: A second gatherer will join to assist. By upgrading our Gatherer Hut another time with softwood boards and stone we get third worker and the possibility to collect mushrooms. If we don’t fancy any herbs or mushrooms, we can simply turn this production / collection off in the building’s menu. Upgrading buildings will be crucial later on: we can use more workers without consuming additional precious building space and we can harvest or produce other, better goods. We have to keep in mind that we need to provide more food as more workers occupy the building. This also means we should keep related buildings close together, reducing the transport routes. While upgrading a building the workers will stop working and don’t provide any products anymore. Of course we want to offer you the choice to immediately place higher tier buildings, or to stay with lower tiers and upgrade them at a later point. If we place a new Gatherer, it doesn’t have to be Tier 1, we can also build Tier 2 (or 3 respectively) directly. Sometimes, if we are short on higher tier resources for example stone, we might want to build some lower tier buildings. Tier 2 buildings only use wood, this saves us stone, which can be used somewhere else. To place a Tier 1 Gatherer we need 4 softwood logs. To place a Tier 2 Gatherer we need 8 softwood boards. To upgrade a Tier 1 Gatherer we need 6 softwood boards. Upgrading only consumes 75% of the Tier 2 building costs, so you can save some materials through upgrading instead of directly building the higher tier. The downside is a longer construction time and the additional consumption of lower tier building materials. This is a nice playground for optimizer among us. What is your stance on upgrading versus building several buildings of the same type to boost production? 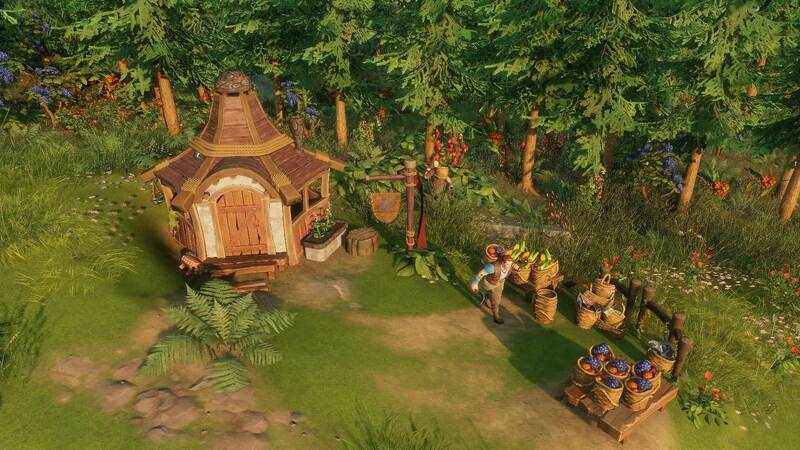 Do you like the evolution of the gatherer hut? Are you an optimizer or is this not your focus? Let us know and discuss it in the comments. The door decoration on level 3 gatherer, where did I see that :). Also as you explained it placing a tier 1 and upgrading immediately it costs 10 soft boards, meanwhile placing the tier 2 directly is only 8 soft boards so it is cheaper. Or you mean to say we can upgrade the tier 1 BEFORE actually building it and in that case it will use only 6 boards. The costs for building and upgrading, caused confusion in the German forum, too. Building a T1 costs 4 softwood, not softwood boards. So in regards to the boards, the upgrade is actually cheaper. In Regards to all used resources, building the T2 build, right away, is cheaper. You have to balance which of the resources you want to use. I just assumed he didn’t want to repeat the word board. So basically to be more precise you mean that tier 1 costs 4 logs(unprocessed wood). Tier 2 costs 8 soft planks which are processed by the sawmill. That makes sense now, thanks. I think plank is more widespread as boards in terms of usage by the way, but I may be wrong. Too bad I don’t speak German, I see there is a lot of activity over there. And thanks to both of you for pointing out we might need to adjust the wording a bit in the future to make things clearer. Speaking of (softwood) logs and (softwood) board is probably the better way to do it. I’ll change the wording above to avoid future misunderstanding. There should be a limiter to prevent you from expanding the base, like production lines being too long, not enough population to assign workers or hazard. For a strategy game, it should be encouraged to juggle with scarce resources in a small space. there are some limitations of course: you will have to increase your population (see the population blog) otherwise you run out of workers. And the longer the distances between production buildings are the more supply-issues you will have. Resources aren’t endless either. But overall you can expand as much as you want across the world; while it’s not supposed to be super easy, The Settlers is not a survival game.